If you somehow missed the viral pep talk Cincinnati Bengals player Devon Still gave his daughter a few weeks ago, watch it now. Not only is it adorable, but also a good reflection of what a kid-friendly pep talk should be: calm, motivational and positive. The term “pep talk” alone begs good vibes. As an adult, it is easy to get frustrated when your child messes up or makes a mistake. But you are the experienced person in that situation. You have the responsibility to pick them up rather than yell or act their age rather than your own. Use positive phrasing: Rather than saying “Don’t get any answers wrong on the test,” try “Answer lots of questions correctly. Remember all of the things we’ve studied together” Try not to use the words “stop”, “don’t” and “no”. Phrasing things positively better guides children into doing what you think is best. Speak calmly, but be present: The most effective pep talks aren’t given by yelling, but rather calm yet strong words. Be present. Make your chat obvious to your child or team and speak to them in words and phrases that keep their attention. Show validation for various emotions: Let your child know that it is ok to feel the way that they do, so long as it is valid. Try saying, “I know that it is hard to lose sometimes, but it’s important to remember that you did your best and that is all you could do. At some point, everyone wins and and everyone loses.” Let them think of how their friends and teammates feel after a victory or defeat as well. The shared sentiments sometimes provide some insight. Listen: Don’t just throw words at your kids and expect it all to sink in. Listen to their problems, feedback and aspirations. If they are happy, let them express it. If they are sad, see how you can help their emotions rather than simply projecting your own. 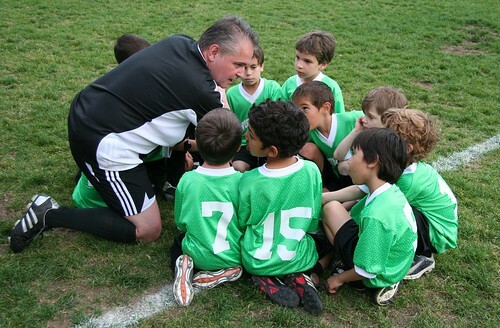 Still stumped on how to give your kid a good pep talk? Check out Kid President. He adds humor and a fresh perspective on the subject. How do you motivate your children in a positive way?